Sabyinyo Silverback Lodge near Virunga volcanoes in Rwanda overlooks Visoke, Mikeno and Karisimbi, three of the five volcanoes in the mountain range. This Gorilla safari lodge is near Parc National des Volcans, Rwanda which forms part of the Virunga Mountain range, a 2 hour drive from Kigali. Gorilla Treks start at the park headquarters, close to Sabyinyo Silverback Lodge, which is convenient for guests to link up with their allocated park rangers. 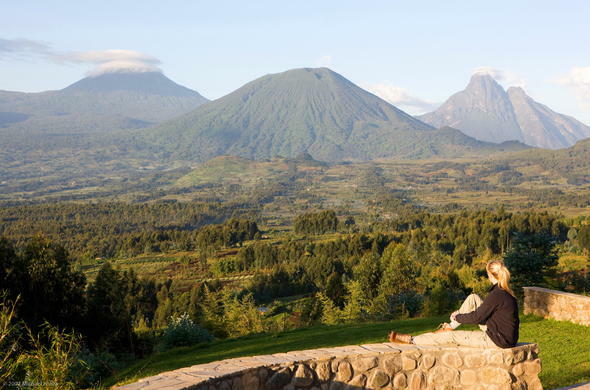 Sabyinyo Silverback Lodge occupies 11 hectares / 27 acres of land near Virunga Volcanoes in Rwanda. The lodge is around 2 000 metres / 7 000 feet above sea level so the climate is generally cool. The grounds are landscaped with native trees, shrubs and plant species as well as an organic vegetable and flower garden. The flowers attract an amazing array of butterflies and insects. Bird watchers will be delighted to note that Rwanda has an incredible 670 recorded bird species. There are 7 habituated Mountain Gorilla families in the Parc National des Volcans, each with around 35 members. The Gorillas are trained to accept the presence of humans but they remain wild. Visitors require a permit (obtained at least 6 months in advance) to see their allotted family group for 1 hour only. Guests need to be reasonably fit to trek over hilly, forested terrain. Gorilla families often move location and guests must be prepared to go the distance. There are regular international flights taking 75 minutes from Nairobi to Kigali. Private charters can also be arranged. To get to Sabyinyo Silverback Lodge, guests travel for 2 hours from Kigali, on reasonable roads through scenic agricultural countryside. The lodge is 200 metres / 650 feet up hill from the car park. The Parc National des Volcans headquarters is 10 minutes from the lodge. Adjacent to the Parc National des Volcans, north-western Rwanda, approximately 3 kms from the main entrance to the Park, and some 2 hours drive on good roads from Kigali.